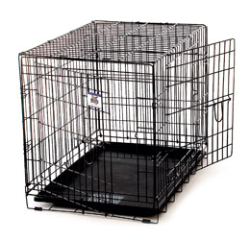 Perfect for home, training, and travel, this multi-functional pet crate is designed with your pet’s safety in mind. Secure latches will not jiggle loose when in downward locked position. Rounded corners on all panels help to ensure safety for owner and pet. Popular suitcase style crate sets-up in seconds and folds-down for storage. Includes removable, easy-to-clean plastic tray and removable plastic carrying handle. Fully assembled, unfold and setup in seconds.